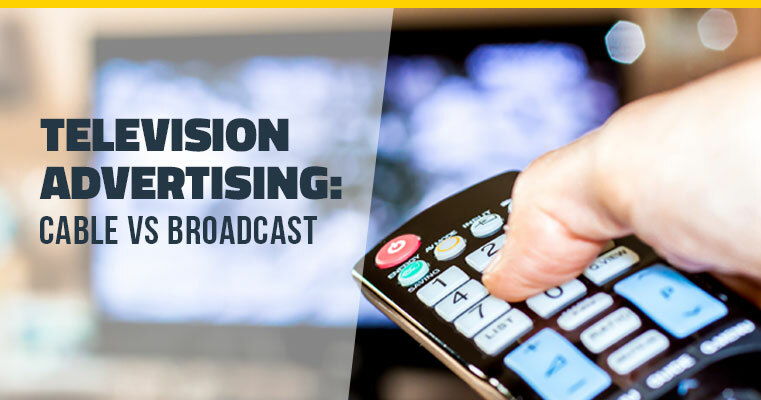 When it comes to targeting a wide audience, broadcast is king. Broadcast networks will always grab more viewers for your spots since not everyone has cable, and some areas are served by multiple cable companies which further fragment your viewership. If you’re trying to target your entire metropolitan area, broadcast is going to be your best bet. However, advertising on cable television allows you to target audiences more specifically based on the channel’s demographics. This could be a good option for some - if your company’s focus offers a niche service or product, for example. But if you’re looking to capture a more universal audience you may want to look into marketing on Broadcast TV. Cable TV typically allows you to buy time for a specific zone of your market. This can save you money, since you don’t have to pay for areas that you have no interest in targeting. Broadcast networks, on the other hand, make you buy time for the whole market. If you’re looking to gain exposure in the entire metropolitan area, this is the best bet, but if not, you could end up spending money on exposure you don’t need. Paying for spots on expensive broadcast networks is going to cost you. Since they are getting so many more viewers, they have a greater ability to charge you more. Cable will leave you with a smaller bill at the end of the day. It will also play your spot much more frequently, and build greater awareness with the smaller audience that you do reach. This frequency is important - studies show that it may take as many as three or four exposures to your brand for it to stick in a viewer’s head. Depending on your business’s needs, it may be more effective for a smaller viewership to see your spot a few times than a larger audience only seeing it once. It’s important to consider your target audience, location, and budget when making the decision on how to advertise your business on television. If you can afford the costly exposure broadcast television provides - great! However, consider whether your money might be better put to use elsewhere. A specifically targeted niche audience on a cable TV channel may draw more business in the long run. Consider working with media placement professionals to save your company time and money. Right Idea Media & Creative subscribes to the most trusted and up-to-date research to be certain that our client's television and radio spots are placed across the best stations for their goals. Contact us today if you want to learn how you can utilize an agency to place your media at no extra cost to you.